Genuinely inspiring people talking about what they love… and they all happened to be women! 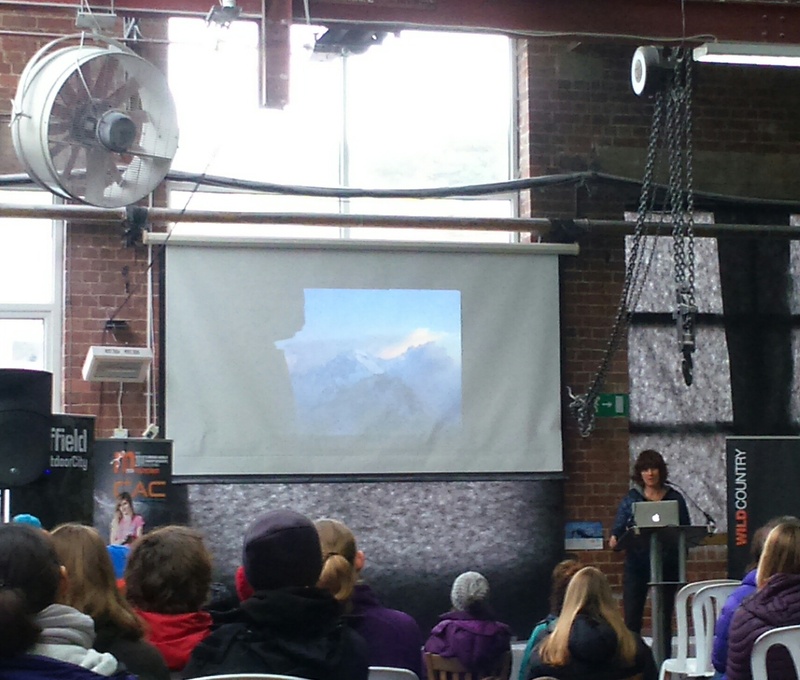 I haven’t been to the Women’s Climbing Symposium before so I jumped at the chance to go when I found out that this year it would be held at the Climbing Works, Sheffield. The event is designed so that each person can take their own ‘pathway’ through the day by choosing workshops tailored to their own interests. 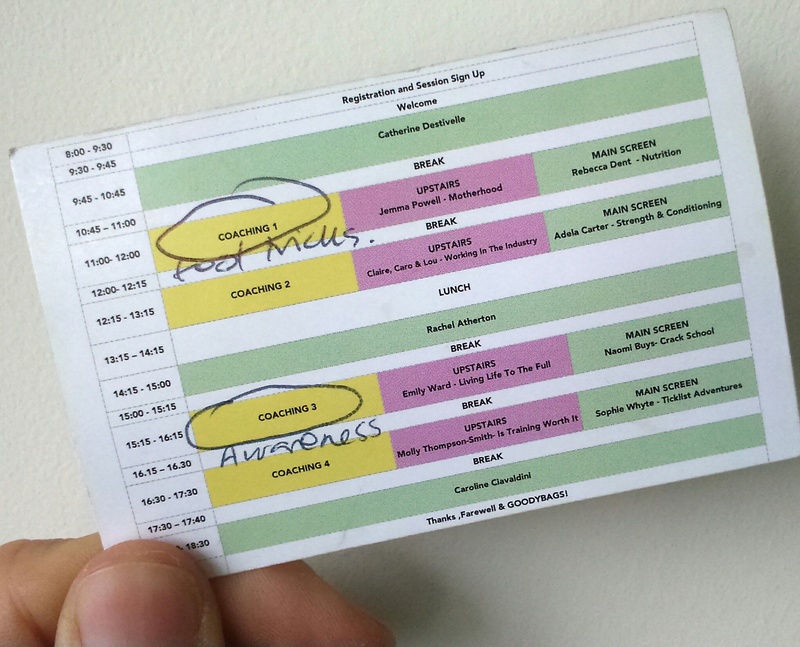 The timetable was full and included presentations from three headline speakers, a film at lunch time, and four talks or coaching workshops. I love climbing because of the places it takes me, the experiences I have, and the sense of achievement it gives me. I love to hear other women talking about their experiences so I chose the talks over the training workshops. All of the women delivered their talks really well and were genuinely inspiring. The opening speaker was Catherine Destivelle, and this was a real highlight for me. She is one of the most outstanding all-round female climbers of all time, and it was a privilege to see her talk about her climbing career and life. I’m amazed by the variety of hard climbing she has done. She was concerned that her achievements only received attention because she was a woman, but the mountains are gender-blind and Catherine “was not thinking girl or boy” when she made her groundbreaking alpine first ascents, solo. Three ‘Women in the Industry’ – Lou, Caro, and Claire, a mountain guide, entrepreneur, and creative consultant, talked about how they have made their careers by combining what they love and what they are good at. Everyone can learn from their emotionally intelligent approach to work and life. At lunch we had the chance to watch ‘Operation Moffat’ by Jen Randall and Claire Carter. The film is about Gwen Moffat, Britain’s first female mountain guide, another pioneering woman who did things her own way, taking her love of mountains to the extreme. Asking themselves ‘what would Gwen do?’ Claire and Jen climb routes barefoot and jump in mountain lakes… but does the reality match Gwen’s idealistic memories? You’ll have to watch to find out! The main speaker after lunch was Rachel Atherton, Britain’s most awarded mountain biker who also enjoys climbing. She gave a really fun talk with lots of videos, explaining how she recovered from injury and sharing her approach to a sport that in common with climbing can be dangerous, and physically and mentally challenging. I really enjoyed talks on Living Life to the Full – Emily Ward, and Ticklist Adventures – Sophie Whyte. I don’t remember meeting many women that talk about being expedition leaders, or completing ticklists of adventurous routes. They are fantastic examples of women who are out there doing it, this event is the perfect platform and I would love to hear more from women like them! In the final session of the day Caroline Ciavaldini described her route to becoming a ‘Professional Climber.’ Her advice is to take ‘baby steps,’ and stay focused on the short term goals. She never expected to become a trad climber, and got into it because James Pearson was so handsome! She later married him and they are an unstoppable climbing team, which reminds us that although this was a women-only event, we still love the men in our lives and value their support. I would have liked the introduction to the event to address specifically why a women only event is necessary, but the event itself didn’t dwell on the fact that that we were all women. We are just people talking about what we love, and in my opinion that’s exactly how it should be.